Editor/Author Singer, Merrill and Erickson, Pamela I. 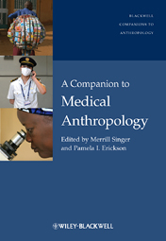 A Companion to Medical Anthropology examines the current issues, controversies, and state of the field in medical anthropology today.Examines the key issues and current debates in medical anthropology. Provides an expert view of the major topics and themes to concern the discipline since its founding in the 1960s. Written by leading international scholars in medical anthropology. Covers environmental health, global health, biotechnology, syndemics, nutrition, substance abuse, infectious disease, and sexuality and reproductive health, and other topics.